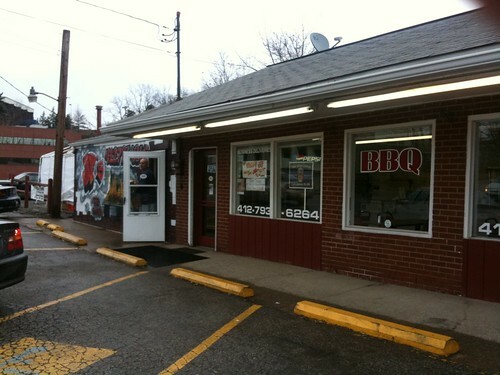 I've found barbecue in Pittsburgh that I like! 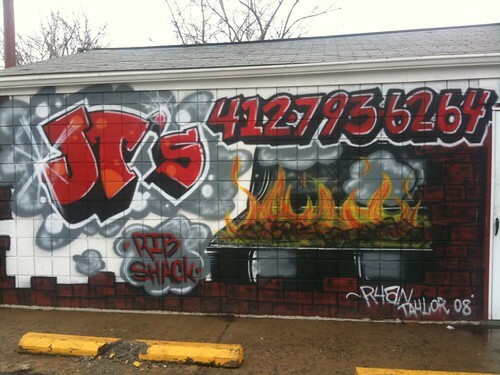 On Sunday, I went to JT's Rib Shack in Penn Hills. JT noticed me taking a picture of the exterior. 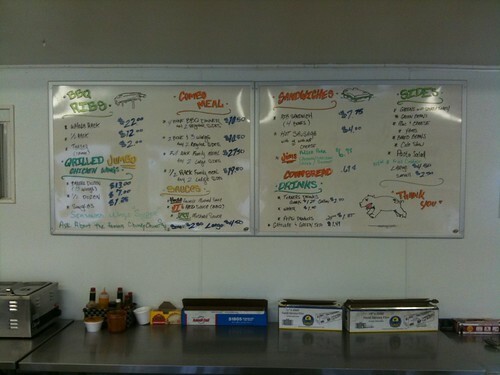 I ordered a ribs and chicken combo on the recommendation of the woman behind the counter, and then JT showed me around and encouraged me to take more pictures. 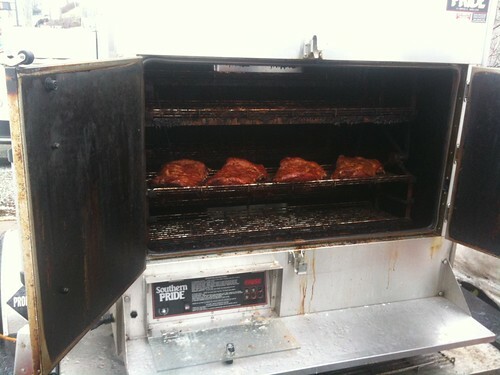 He opened the smoker for me to take a picture. I asked about a pan that held barbecue but no meat. 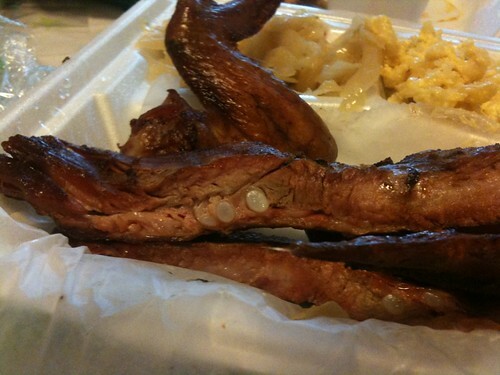 He said that it caught the drippings from the brisket. I responded eagerly at the mention of brisket, and he he agreed with me that it was hard to get good brisket in Pittsburgh. 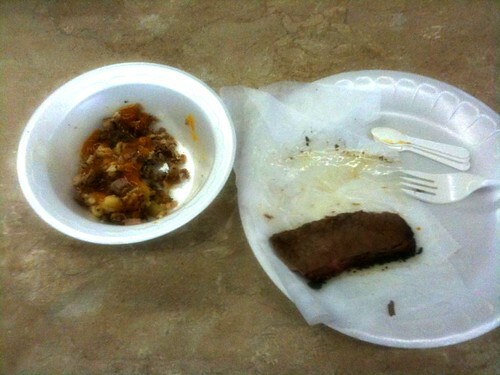 I went back in to wait for my food, and JT brought me in a sample of the brisket. It was tender, smoky, and luscious. 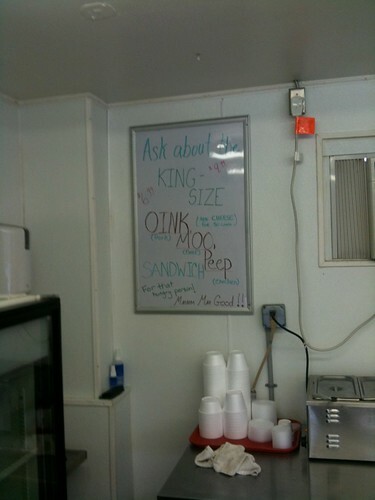 He also let me sample the filling for his recent sandwich creation, the "Oink Moo Peep": a mixture of chopped brisket, pork, and turkey, on a bed of macaroni and cheese. It was a yummy combination--I'm going to have to try the full sandwich soon. Another question came up: what sauce did I want? JT offered me samples of all three of his sauces. The mustard sauce was pleasantly tangy, the red sauce was vigorously spicy, and the "Chunky-Chunk" sauce was a combination of the two with jerk seasoning added. I chose the mustard sauce. I finally got home, rolled up my sleeves and put my hair in a ponytail, and sat down to my feast. The ribs were delicious, tender enough to slide off the bone easily, but sturdy enough to reward chewing with delicious smokey flavor. 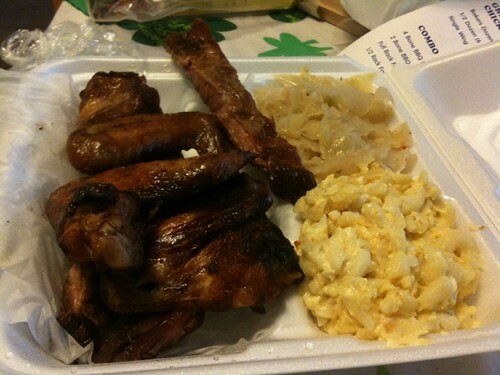 The grilled wings were savory and flavorful--they aren't my favorite yet, but they have convinced that there's a legitimate place for them on a barbecue menu. The macaroni and cheese was just the way I like it, with visible hunks of cheese among the noodles, and the fried cabbage was succulent and flavorful. I am eager to return.